1. A juicy slice of tomato on a burger or sandwich of your choice. I love Veggie burgers with hummus or guacamole. I also enjoy a mozzarella cheese, basil pesto, sliced tomato, and balsamic dressing sandwich. 2. I toss fresh tomatoes into a pan to gently sear them and add to a sausage and veggie pasta dish. 4. Any type of vegetable kebab for the grill. 5. Eating small fresh ripe tomatoes as a snack! 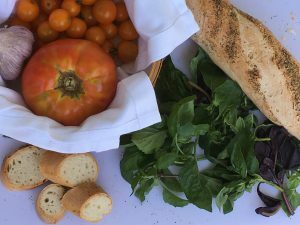 These are just some of the simple ways I can think of to add in tomatoes but there are so many other simple and complex recipes to try out with tomatoes. Now is of course the best time to eat them while they are ripe, and available locally. Look for them at your local farmers market, and give this recipe a try! 1.In a medium mixing bowl, add the tomatoes, garlic, basil, vinegar, olive oil, cheese, salt and pepper. 2. Mix thoroughly and let sit for at least 15 minutes at room temperature to let the flavors marinate.